I have officially turned 30 years old this morning. That’s three decades. I remember turning 10, that was a big deal in 3rd grade. I honestly have no recollection of my 20th birthday (I was poor in college and not yet married). And now my 3rd decade has begun. For others who have turned 30, there is dismay or a soul searching. In the show friends, there is an episode where Rachel turns 30, and suddenly every becomes shell shocked remembering how horrible their 30th birthday was. I think I remember Joey just yelling, “Why, Why Why?” I’ve thought about it a bit, and I decided a while ago, when I realized I would turn 3o today, that I’m glad to have made it this far. Someone posted to my facebook page that “Birthdays are good for you. Statistics show that people who have more live longer.” I feel that way, and I feel like I’ve used those 30 years well. (1) I was born in 1982 – I am glad that I exist. Non-Existence does not suit me. (2) I love my family. Some people don’t have that, and I am so grateful. (4) I went to college. Flagler was eye opening for me, and I’m thankful for the professors who kicked me around a bit. Anastasia Baptist Church, you took good care of me too. (5) Dj Why and the Image, a college band with Matt and Ryan, was so much fun. I remember the shows in my mind, and it was good for me to be so nervous but have so much fun. (6) I married a strong, courageous, and intelligent woman – all of those traits, you would have to have to stay married to me for long. I can’t imagine life without her. (7) Seminary was the hardest thing I have ever done. God gave me a wall and said Climb. I did, and I can’t believe I made it through. The Bible is a rock and I know that more solidly thanks to Gordon Conwell. Too many good friends from there to count. I miss you all. Grace Chapel and Gravity, you are all in my heart. Sometimes I wake up and think I’m about to head to Lexington. (8) Saint Andrew By-The-Sea United Methodist Church, her people have welcomed us, and I am so glad to have discovered Methodists. I hardly knew my theology was already articulated so well and practiced so fully. Glad to be here. Bluffton and Hilton Head have become a home. (1) Tying shoes was tough. (3) I rebelled hard in High School (no drugs, no alcohol, just angst that pushed outward) – which I think my parents have forgiven me for. (4) Freshman year of college was no breeze – thank you to my English Professor for taking me aside and asking me what was going on. It changed everything. (5) Amanda – I asked you out in the worst way possible. Thank you for marrying me anyway. (6) The guitar is something I love, I think I will master, but never have. I love it….I hate it. One day I will conquer that hill. (7) Gordon Conwell, midnight, Greek workbook – head on table about to break emotionally. It wasn’t fun, but I have it forever. (8) Learning to lead – I’m still figuring this out. Pray for me. I’ll pray for you. God is with us. All in all, I’m excited that I survived this long. Many don’t see life this way, but I am a strategist at heart and I see life as a battlefield. My favorite scripture verse is from the book of Joshua in the Old Testament. Chapter 1, verse 9: Be Bold and Courageous for the Lord your God is with you wherever you go. Joshua was leading the Isrealites into battle, and they won some, they lost some. We all do the same, but God is with us regardless. I can feel his presence and I’m looking forward to walking in His path for the next 30 years, and hopefully…the next 30 years after that. Peace to you. DG! 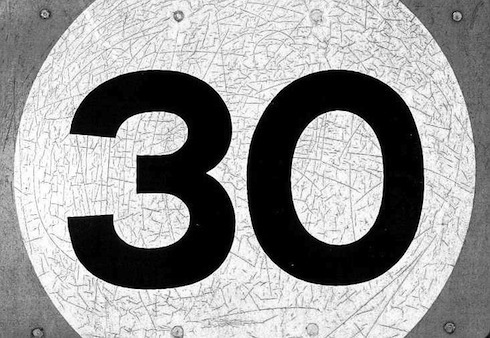 Loving this post, that’s the best way to bring in 30. So glad you didn’t go the depressing “I’m so old” route (I personally enjoyed the company of rebellious High School Dan haha).